Our gift to our loyal customer base this Spring is helping them get race-ready for a little less coin than normal. For those who are not familiar with the REV'IT! suit or glove lineup, please keep reading and I will break down the gear. REV'IT! is featuring two new suits for 2010, the REV'IT! Victory Suit (Pro Level worn by De Puniet, Bautista and Kern) and the REV'IT! CR Suit (entry level). The Victory has all of the top-end bells, whistles and protective features. The CR, which stands for Cafe Racer and has a retro feel, has a few less space age technologies but is a solid suit in with a great look at a thousand bucks. REV'IT! is coming back this year with the REV'IT! TT Suit (pictured above being worn by de Puniet in '09 GP class). The TT has only a few less features than the Victory and was their previous pro model, the catch on the TT is that the price actually cam DOWN for 2010 to $1299.99 which we love it at. Check out the video below for the suit breakdown. With regard to the gloves, the REV'IT! GT Corse (left) was REV'IT! 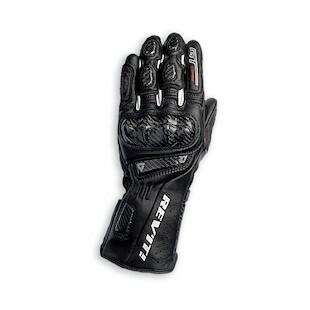 's top end glove up to 2008 and actually got Warm Weather Race Gauntlet of the Year from Motorcycle.co.uk . It features a double cuff system, Kevlar, Carbon Fiber, Superfabric and external hardparts. The GT Corse is priced at $160 and was eclipsed by the REV'IT! Jerez Glove for 2009 at the pro level. The Jerez uses some additional hard part TPU's, sliders and is slightly beefier which give it the edge. 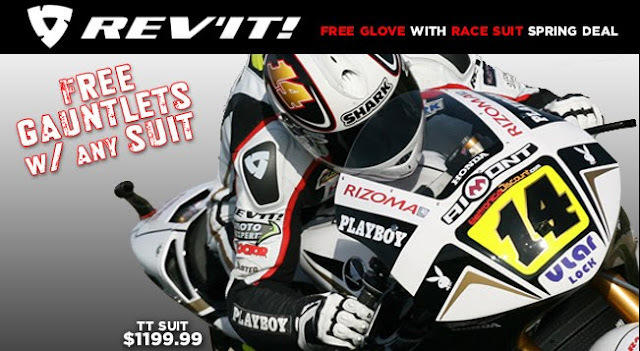 Also available as the Free Glove with suit is the new 2010 REV'IT! SLR Glove (right) which will not be available until mid march and is slated to be $139 out of the gates. The SLR is newer with a slightly more forgiving cut than the GT, but it does not have some of the space age features like SuperFabric sliding panels. As a corollary, the SLR does have a new dual compound palm slider and styling that the GT Corse wished it had in its bag of tricks. Check out the SLR video below. Either way, both gloves are a track-ready win. I think the decision comes down to availability and styling. If you have any questions don't hesitate to give us a ring for help. Navigating the suit buying waters can be tricky. We are here to help. As always we have a limited supply of free glove inventory and we will run this deal until that stash is toast. BoochZilla from RevZilla HQ - Out.